Wes Hollands became a Toastmaster after he retired very early, as sitting down all day watching TV is not his forte. 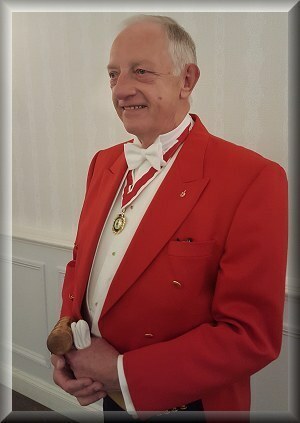 After training and exams to become a Toastmaster, he also became Beadle to two Worshipful Companies and spent eight years supporting the ceremonial before becoming a Liveryman of both. Asked what his favourite function is, he said attend the Mansion House, Guildhall, but most of all making a young couples day the best day ever, so the memories last forever. His style is professional with a smile and the confidence that he knows exactly what he doing and the client requires. His favourite saying is “it’s great to put smiles on people’s faces”.